If I had my way there would be even more clematis plants in my garden. I am working on that. I just bought an evergreen clematis, Clematis Armandii ‘Snowdrift’ (Pruning Group 1, or minimal pruning in spring). This will be perfect to train up the new fence I just had built for even more privacy from neighbors. I am so psyched. As it is, I have quite a few clematis vines in my garden. Fortunately, many of them are blooming right now. Take a look at what is blooming right now. Clematis Naobi is one of my favorites. It is a deep red, almost wine colored. I have it growing on the same fence that I just had built. This is a very happy clematis vine. It is a Pruning Group 2 or 3 clematis, so you can prune it moderately or hard. Also on the same fence, but not yet blooming is a beautiful blue clematis with a light blue center on the petals that is not well defined. I have no name for this beauty. I treat it as a Pruning Group 2 clematis. About five feet away is my herbaceous clematis, Clematis Recta Purpurea. This one has purple new foliage and many, many tiny white flowers less than an inch across. This is in Pruning Group 3 and gets hard pruned in spring. On my back fence is a light blue clematis, almost a pale periwinkle color, Clematis Julii. This one is blooming for the first time this year. I am so happy to see it. It has taken its time to start blooming. I think this is Pruning Group 2. Finished blooming, is my Clematis Montana Rubens Superba. It bloomed quite a bit earlier. What I love about this one is the purple color of the foliage combined with the pale, ethereal pink of the flowers. Here you can see the beautiful color of the foliage. This one is also Pruning Group 1 and gets minimal pruning. Almost blooming on my back fence is this mystery clematis, whose tag fell off. I can see that it is about ready to bloom and the color looks like it will be red or dark pink. We will see very soon. Next to it is Clematis Crystal Fountain, which is almost finished blooming. It is a gorgeous clematis with pale purplish pink blooms. This last flower is looking a little bedraggled, but you can imagine how lovely it is when it is in its full glory. This is also the first year that this one has bloomed. This is a Pruning Group 2 clematis. Also not yet blooming is this very happy Clematis Jackmanii. Do you believe that this is a Pruning Group 3 clematis, which I hard prune every spring. It is growing like bonkers. A little later it will have many dark, blue-purple flowers. This gorgeous red clematis is another one that I have no name for, but look how happy it is. It is currently in full bloom, but will rebloom later in the season. I also treat this one as Pruning Group 2 in spring. If anyone recognizes this one, let me know. These are not the only clematises that I have. I have several others which are not currently blooming on my deck. I have a white flowered evergreen clematis (not Armandii), which is not at all hardy, and which stays in a pot and goes into the garage in fall. I also have a red one that is still in a pot until it gets a little bigger. Last week I fell in Lust with a clematis which is a very dark purple, almost black clematis, called ‘Romantika’. I don’t even have this one yet, but it is my next purchase, maybe even this weekend. To find out a little more about how to prune Clematises and what the pruning groups mean, here is a short video that may interest you. Well, there it is. These are the Clematises blooming in my garden. Hope you enjoy your tour. I will be joining these garden parties. Come and join the party.
. Thursday Favorite Things – I’m joining this week again.
. Share Your Cup Thursday – And also here.
. Fertilizer Friday/Flaunt Your Flowers – I’ll be joining Tootsie Time this week also.
. Cottage Garden Party – I’ll be joining the as well.
. Floral Friday – I’m new here.
. Flowers on Saturday – Link coming soon. Wow, you clematis are beautiful. Mine bloomed earlier this summer and then died, I think they were planted in a spot with too much sun and possibly weren’t watered enough. Stopping by from Katie’s linky to say hi. So many pretty varieties of the flowering vine, really beautiful and healthy looking, too. Visiting from Thursday Favorites. Thanks for coming by and thanks for your kind comment. Clematises are truly some of my favorite flowers. You have a nice variety of Clematis. I only have one because I wanted one that could get along with less sun so it’s a Sweet Autumn Clematis with the tiny white blooms. Thanks for the video, it’s always good to learn more! Thanks. Many clematises can get by with partial shade. The one that grows most vigorously at my place (Jackmanii) has shade before 9-10 and after 2. And it blooms profusely. So don’t give up. You can have more. Check the label and ask the garden center when you are looking. I would love to have Sweet Autumn in my garden. I need something for later in the season. Beautiful flowers…stopping by from Katies Linky. Your clematis plants are beautiful. The mass of flowers on the second one is so pretty. I haven’t see that colour of foliage that is on the Montana. I watched the video too! Thanks. I really love the one with the profuse blooms. We had it in a pot for ever so long and it got only 3 feet tall as it is supposed to do. Now that we put it in the ground, it gets almost 5 feet. That Montana is one of my favorites. I will say that the foliage color is a little bit of a surprise to me too. We had one in our previous home and the foliage had a purple cast on green leaves. This one is downright Purplish red. Love it. Can’t wait till it gets bigger. All your blooms are gorgeous! I very much enjoyed my tour. What big beautiful blooms. I see these on mailboxes in NC…very showy! Thank you for coming by and thanks for your comment. I see them on mailboxes here too. Very pretty. And very pretty wherever they are in the garden. I don’t blame you for wanting more. They are so beautiful and such variety. They seem to all be very happy to be in your garden as well. Thanks. I really love clematises. They add so much to the garden. And best of all, they grow vertically so I can plant more. Hi i am new here, i find clematis really beautiful, but just from blogs as it doesn’t like our climate. One of my blogger friends in the US sent me seeds to try, but they didn’t even germinate. So sad because they are amazing plants. If you have all clematis in your property, it can be considered a Clematis sanctuary, and many people will visit. What about that! Thanks for coming by. It is too bad that you are unable to grow clematises where you are. I really enjoy them. Although I am sure you can grow things I can’t as well. I sometime miss the oranges and bouganvilla from a warmer climate I once lived in. Interesting about the Clematis sanctuary. Don’t think it would work in my small yard. Still a friend was on a garden tour because of her clematises. It does, indeed, seem like a good year for clematises here too. Sorry about your Recta Purpureas. So far, I haven’t had and problems with self seeding. However, I have had a few of my clematises self layer. Good, more clematises. Just don’t want too many babies like it seems you have had. Your clematis is gorgeous. Love the colors. We have one plant that used to bloom. They are so lovely. Thanks for coming by. There are a few reasons that clematises don’t flower. It could be getting fertilizer high in nitrogen when it really needs one higher in phosphorus and potassium (A good slow release 5-10-10 fertilizer in spring or one for roses would be good) You could also be pruning at the wrong time of year. If you have an early bloomer, prune right after they flower as these usually bloom on old wood. Otherwise prune them when you prune your roses in late winter or early spring. Or, if you know what pruning group it is in, follow those instructions. If, over time the top has become shaded, it may not flower either. See if you can’t give it some more sun. Your garden is beautiful, I love the clematis and thanks for the pruning tip. Very helpful. Thanks for coming by and thanks for your comment. I love clematises too. In fact, I just reserved yet another one at a nursery I am going to tomorrow. Hi Yael: Wow–your clematis are just gorgeous! My Jackmanii is starting to bloom, and General Sikorski with big lavender flowers has been blooming for a while now. I also have and love Niobe, which is in bloom here as well. Princess Diana just started to bloom–it has small pink bell-shaped flowers, which I love, and I’m waiting for Bill Mackenzie to start blooming in July or so–huge plant covered in yellow bells! Have a great weekend–it’s supposed to rain here all weekend, so I’ll be getting caught up on things in the house. Thanks. And thanks for coming by. I looked up your General Sikorski and it is lovely. I would love to have one the color of Bill Mackenzie (especially because it is a late bloomer), but would want one a little smaller in size. I reserved a Romantika at Joy Creek to pick up tomorrow (yay), maybe I will see what they have that might fit the bill. Thanks for your comments and for your warm welcome to your Garden Party. Thanks for coming by and for your kind comment. Hope you have a wonderful weekend as well. Beautiful ! I enjoyed the tour…you have so many varieties! Thanks and thanks for coming by. Clematises are certainly a joy. We are buying yet another one today. Thanks for coming by. The wine colored one is Niobi and one of my favorites. Wow, you have some gorgeous Clematis. I love them! I only have 4, but hope to add more. I really want a Jackmani. I don’t always know which Clematis I should cut to the ground and which get new growth on old. I guess now with google you can find anything out, right? lol! Thanks for the video and thanks for sharing with Share Your Cup. Thanks. You will Love Jackmanii. 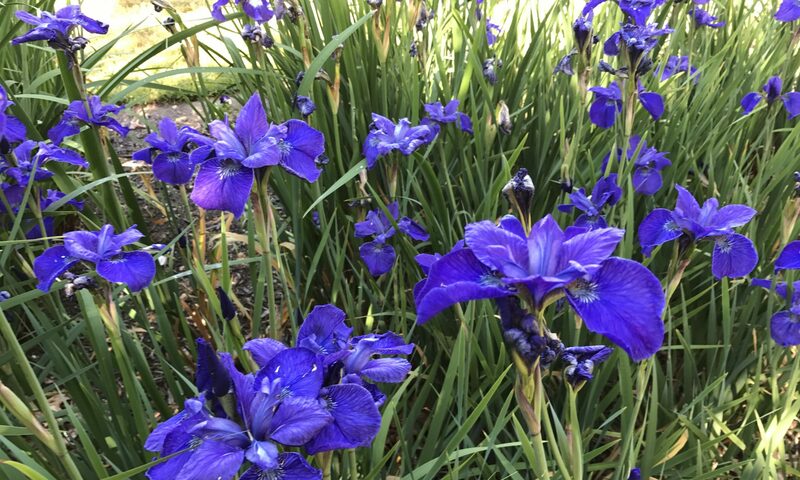 It is a vigorous grower, and I love the color of the blooms…a dark vivid blue. Glad the video eas helpful. I don’t claim responsibility for producing it, but it is really useful when you find something on the web which helps with your own explanation. And I just bought three more clematises to add to my collection. Now where to plant them. Wonderful post with some delightful photos! Thank you for participating in Floral Friday Fotos! am just so happy to see that you have linked in this week…and to have the chance to visit here today!! I thank you so much for linking in and sharing your post with my party today! which clematis are type 1,2 or 3 and how they are pruned? I keep looking and hoping to come across this information along the way.